Danny Briere was the National Hockey League's leading scorer in the first round of the playoffs. The first step on the Philadelphia Flyers’ journey to the Stanley Cup was riddled with questions. How would goaltender Martin Biron hold up in his first-ever playoff action? Could Daniel Briere make up for a lackluster first season in black and orange? And how would the Flyers try to slow the League’s leading offensive force, the Washington Capitals’ Alexander Ovechkin? Seven games later, all the answers were as clear as the Flyers’ path to Montreal and the Eastern Conference Semifinals. Biron was excellent, Briere was the League’s leading scorer in the first round of the playoffs, and Ovechkin was held in check just long enough for the Flyers to advance. The Flyers looked to have things in hand through two periods in Game 1, as Vinny Prospal and Briere had two goals and an assist each in the first 40 minutes, and the Flyers took a 4-2 lead into the third period. It was a fleeting advantage, though, as Mike Green scored twice to tie the game. His second goal came at the expense of Flyers forward Patrick Thoresen, who slid down to block Green’s shot on a power play. The puck hit Thoresen in the groin, leaving the player writhing in pain on the ice. Play continued, and Green blasted a slap shot past Biron to tie the game. And after keeping Ovechkin in check most of the game, the Great 8 exploded on the scene with the game-winner. He tipped the puck away from Jaroslav Modry deep in the Flyers’ end, eluded Lasse Kukkonen and scored past Biron with 4:32 left for the winner. The Flyers recovered quickly in Game 2, as Biron silenced any lingering doubters with a 24-save shutout in a 2-0, series-tying victory. "He played excellent," center Mike Richards said after that game. "He made the big saves at the beginning of the game. I think he had three or four point-blank opportunities that he made the save. When your goaltender does that, it gives us opportunities and momentum the other way." The joy of the victory grew when Emily Marie Biron made her first appearance in the world on April 14 – at 5 a.m., so dad Marty could get to practice the next day. There was no exhaustion for the new daddy, or his teammates, who made their Philadelphia playoff debut a successful one. Briere scored his third goal of the postseason late in the first, and the Flyers extended the lead to 3-1 when Scott Hartnell and Sami Kapanen scored 17 seconds apart. Briere scored another goal in the second, and Richards and Mike Knuble added third-period goals as the Flyers took home a 6-3 victory. 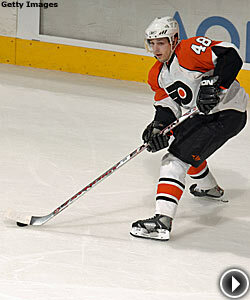 "Danny had a twinkle in his eye," Flyers coach John Stevens said about Briere that night. "He looked like a player who was going to play the way he did." Game 4 was the hardest-fought in the series, as the teams combined for 67 hits, including 10 by Ovechkin. But bodies were the only thing Ovechkin was hitting, as the Flyers continued to utilize the defense pairing of Kimmo Timonen and Braydon Coburn to limit Ovechkin’s opportunities. A pair of goals by Carter, including one just 42 seconds into the game, offset a pair of Washington goals off Ovechkin assists as the first period ended 2-2. Steve Eminger put the Caps ahead in the second, but midway through the third, Briere tied the game with a power-play goal. The game stretched to double overtime before the line of Carter, Upshall and Knuble controlled the puck down low, with Carter throwing it into traffic in front. Knuble escaped from the pile with the puck and scored the winner at 6:40 of the second extra session. "It's an unbelievable feeling to score in this town and hear the building go nuts," Knuble said after the game. "You pinch yourself. You can't believe it's happening." The Flyers squandered their first chance to advance, falling 3-2 in Game 5. Then Ovechkin took Game 6 by himself, scoring twice, including the game-winner, in a 4-2 victory in Philadelphia that forced the decisive Game 7. Less than 24 hours after Game 6 ended, the puck dropped in Washington for Game 7. Nicklas Backstrom gave the Caps an early lead, but Upshall and Kapanen put the Flyers ahead until Ovechkin scored with less than five minutes left in the second to force overtime. While the Flyers tired, Biron held strong, stopping 20 shots in the third period and overtime. The Flyers, who finished the regular season with the second-best power play in the NHL, capitalized on their only overtime power play when Joffrey Lupul knocked in the rebound of a Timonen shot 6:06 into overtime. Questions had also surrounded Lupul, who had just one assist in the series.